The Tom family settled in Kosciusko County in 1837 on some of the same farm land operated by Tom Farms today. The family’s ancestry traces back to Scotland. After immigrating to America and first settling in the original 13 colonies, the Tom Family made their way west to Indiana. 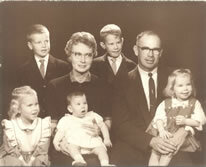 Everett and Marie Tom founded Tom Farms in 1952, both of Leesburg, Indiana. Today, Tom Farms is one of the largest suppliers of seed corn and related services to Monsanto Company as well as a major supplier of corn and soybeans to processors and livestock operations. Tom Farms is a multi-generation, family owned organization firmly planted in fertile prairies of North Indiana more than 173 years ago; Tom Farms has evolved into a global crop production, sales and service company and industry leader. Today we are one of the leading suppliers to Monsanto’s seed production supply chain.